Rumors of a new 4-inch iPhone 6c are once again making the rounds. The idea of Apple expanding the iPhone line to include simultaneous development of three different screen sizes is intriguing because it may be the missing piece that allows Apple to reposition the iPhone line for a more sustainable future. Given current smartphone market dynamics, it would be in Apple's best interest to continue expanding the iPhone line as the product matures. Not only would an updated iPhone with a 4-inch screen appeal to a certain segment of the market, but Apple could position the new model as a way to begin differentiating the iPhone line according to it's primary distinguishing feature: screen size. 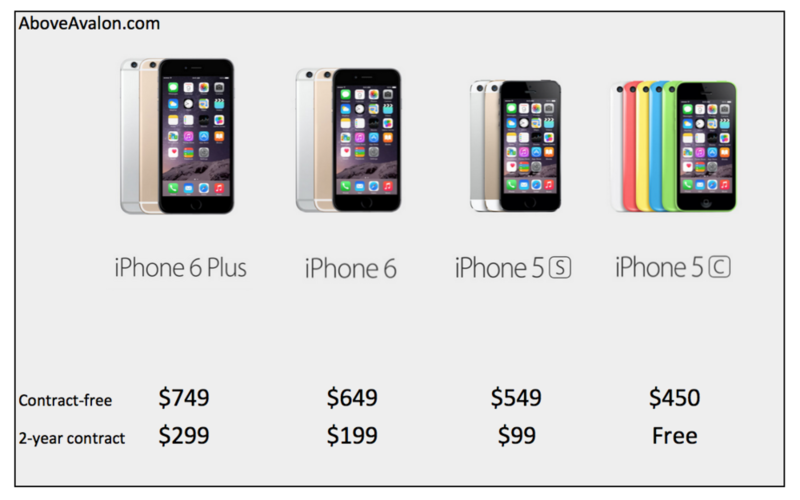 The current iPhone line is effective in selling Apple's flagship phones (iPhone 6 and 6 Plus). Apple currently sells two-and-a-half iPhone 6 units for every iPhone 6 Plus sold. With the iPhone 5s and 5c, Apple relied on its existing strategy of taking last year's models and reducing the price by $100. Apple continues to have each price segment covered ranging from a contract-free $749 to $450. Apple's current pricing strategy is also supportive of the carrier subsidy model as the $450 differential between a 2-year contract price and contract-free price is upheld across the product line. A new iPhone with a 4-inch screen (the "iPhone 6c") would have several longer-term implications for the iPhone line. For the first time, Apple would have three different-sized iPhone models under development (5.5-inch, 4.7-inch, and 4-inch) as the iPhone 6c would see an update from the iPhone 5s and iPhone 5c, including possibly a different design. More importantly, Apple would be able to position iPhone screen size, and not product age, as the primary pricing differentiator going forward. Apple wouldn't reduce the iPhone 6 and 6 Plus by $100 this year, but instead sell a new iPhone 6s and iPhone 6s Plus for the same $649 and $749, respectively. The iPhone 6c would be positioned as the device for those who want to spend less money on an iPhone while the iPhone 5s would occupy the "free with carrier contract" bucket. Drive consumers to iPhone 6s Plus and iPhone 6s. An iPhone 6c could be positioned to drive consumers to purchase the flagship models, the iPhone 6s and 6s Plus. After looking at the various options, including the iPhone 6c, consumers may be more willing to pay the extra $100 for the iPhone 6s. Apple relied on a similar strategy in 2013 with the iPhone 5c. While some thought the iPhone 5c would sell well, it ended up driving people into buying the more expensive iPhone 5s. This is a smart marketing decision by Apple designed to maintain the integrity of the iPhone line by getting consumers to buy the latest model, even though they may be satisfied with an older model at a lower price. Apple would benefit from earning additional revenue if consumers chose an iPhone 6s or 6s Plus over an iPhone 6c. Provide a good 4-inch screen experience for consumers. I suspect there is a certain segment of the population that would still prefer an iPhone with a 4-inch screen. While the larger 4.7-inch and 5.5-inch screen options would outsell an iPhone 6c, the ability to use an iPhone comfortably with one-hand, store the device in small pockets, or use the device during workouts make a 4-inch screen desirable for some consumers. Apple has relied on reducing the price of previous year's flagship models to address price-sensitive consumers. Such a method has been successful in maintaining an "Apple-like" experience at lower prices. However, with Apple now selling two flagship models with different screen sizes, a new strategy is needed in order to set the iPhone on a more sustainable path. If Apple sticks with it's current strategy, within three years there would be an iPhone with a 5.5-inch display selling for anywhere between $299 and $0 with a two-year contract as Apple reduces the price by $100 each year. Not only would this be confusing from a customer's point of view, but Apple may be jeopardizing the iPhone's average selling price and the important iPhone upgrade cycle as consumers decide to buy older, less expensive models. Instead, the iPhone 6c would be the first sign that Apple is moving to a different strategy where specific screen sizes occupy set price tiers. To better view this strategy, replace each iPhone model nomenclature with its screen size. Apple now has three Phone tiers (5.5-inch, 4.7-inch, and 4-inch screens) designated for the $749, $649, and $549 price layers. This structure would remain unchanged from year to year with new models replacing the previous year's model. Meanwhile, older 4-inch screen models retain some of the old iPhone heritage of seeing price reductions over time. Note: Apple will likely change iPhone case colors. With the iPhone 6 is outselling the 6 Plus by roughly a 2.5 to 1 margin, I suspect many look at 5.5-inches as too large for an iPhone display. Taking a look at Android options, the best-selling phones also seem to come in less than that 5.5-inch range. Even in the scenario where screen sizes become a bit larger, Apple can adapt the strategy by simply relying on the concept of plus, regular (or just "iPhone"), and mini to denote three different screen sizes. The smallest screen option would then be the model to see price reductions over time. By segmenting the iPhone line according to screen size and shipping an iPhone 6c, Apple would eventually be in position to ship the notorious "cheap" iPhone, a two-year old iPhone with 4-inch display that sells for less than $400 contract-free. Such a device would not be sold in areas with carrier subsidies, but instead be focused on emerging markets. Even though $400 is still a premium price for a smartphone, Apple's strategy would continue to focus on slowly, but surely, lowering the iPhone's entry level price. This plan represents a much more realistic option than taking a 4-year old iPhone 6 Plus and eventually selling it for less than $400. Apple is likely doing a much better job at producing new iPhones at attractive margins. In the past, Apple's margin would suffer when there was a new iPhone form factor introduced, reinforcing the need to continue selling that device (with no changes) in subsequent years to recoup some margin. With manufacturing processes improving, Apple no longer has this need to continue selling the same flagship phones for years. Instead iPhone 6 and 6 Plus margins are much better to begin with and Apple can simply shift production to new models each year, while the 4-inch screen model (which Apple has already been producing for years) is the one to see price reductions over time. iPhone storage configurations are another way of Apple will be able to continue boost ASPs and margins. As the iPhone line matures, the current screen sizes will likely be around much longer than smaller iPhone screen sizes found with the iPhone 3G and 3GS, emphasizing the need for a more sustainable strategy of keeping prices stable. While the iPhone 6c is still a rumor, I'm confident that Apple management has been toying with the idea of changing its iPhone strategy in order to assure that the iPhone upgrade cycle remains robust. In addition, Apple would look to expand the iPhone line, both in terms of available models and price points. It is important to remember that there is much more to the equation than simply price. Apple could reduce the price of iPhone 6 and 6 Plus over time and its phone market share will increase. However, such a scenario may contain longer-term negatives that outweigh any near-term positives. Instead, by positioning screen size as the primary pricing differentiator, Apple is able to sell great iPhone experiences at different price layers without much in the way of collateral damage. An iPhone 6c makes a lot of sense.